I was leafing through Scientific American the other day at the library-- don't laugh, my alternative was the "beer barn" in the liquor store parking lot-- and noticed an article by noted artificial intelligence guru Ray Kurzweil. Actually, it was a thinly veiled plug for his new book on "the singularity," or the coming of an age when we will all be connected to each other via electronic networks, and little microscopic robots will help turn us into super people. Once I got over the "Star Trek"-ness of it, it started to seem less science fiction and more black comedy. To think that in only about 75 years we've gone from the idea that computers might be useful for some simple calculations to planning to use them to turn us into what our ancestors would have considered gods is both amazing and disturbing. Kurzweil's "law of accelerating returns" is indeed impressive, and when you think at all the good that might come of leaps in both technology and human evolution, the future looks pretty bright. That is, if we're still actually human. Music has been affected no less drastically. As Brian Eno points out in his forward to the recently reissued and expanded OHM: The Early Gurus of Electronic Music 3xCD box set (now with the addition of a DVD, and re-dubbed OHM+), most of what we listen to is electronic in some fashion, contrary to the entire history of music prior to the 1920s. Whether over the radio, stereo, or amplified speaker, electronic music has all but made "natural" sound obsolete. And of course, this says nothing about the musicians who actually use electronics as instruments, manipulating digits, circuits, and bits to make music-- music that, for all intents and purposes, would have been as unimaginable as Martian rovers to your grandparents. Lucky for us, three generations into the technological revolution, much of the shock of innovation has given way to something of a learned instinct when it comes to this stuff. The groundbreaking experiments of composers like Karlheinz Stockhausen, Pierre Schaefer, Pierre Henry, and John Cage have led to an age where blips and beeps are not only taken for granted but form the basis of a musical education that for most people starts in pre-school with such "advanced" learning tools as Simon Says. 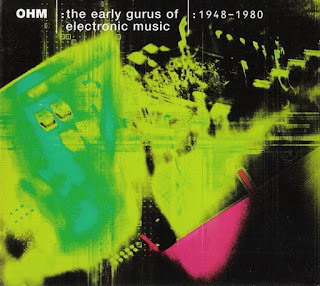 OHM+, covering electronic music from the 1930s to the 1980s, documents a clear and steady path towards an age when most music simply couldn't be made without electronic assistance. The characters involved were undoubtedly experimenters working on the edges of both technology and good old human ingenuity. In many cases, their results will sound strange to ears accustomed to more refined uses of the available tools-- but in others, the sounds are eerily ahead of their time. Regardless, OHM+ is one of the best documents of its kind, and a model for archival compilations. OHM+'s first disc contains music from the earliest days of recorded electronic music, and as much as you might expect it to contain barely controlled squeaks and static, there are moments of surreal beauty. Olivier Messiaen, though hardly known as a preeminent electronic music composer, did use the ondes martenot (a keyboard using a ribbon and ring to change pitch) on "Oraison" from 1937. The melody (borrowed from his own "Louange a l'eternite de Jesus") is perfectly suited to the keyboard's theremin-like portamento (a technique of gliding smoothly from one note to another). Likewise, Clara Rockmore's performance of Tchaikovsky's Valse Sentimentale on theremin transcends gimmick, sounding like an alluring, retro-futuristic serenade. Of course, there is plenty of the hard stuff: check the animated audience reaction to Cage's revolutionary tape-edit piece Williams Mix from 1952, or Tod Dockstader's creepy sound collage "Apocalypse II" from 1961. Stockhausen predates both surround sound and Zaireeka with his four-channel Kontakte, while Edgard Varese's "Poem Electronique", using seemingly random snippets of found-sound and ancient synthesizer squeaks, is actually one of the great early examples of mastering electronic music bit by bit. And if you're left wanting some good old fashioned humanity, Milton Babbit's Philomel excerpt, a duet of sorts featuring synthesizer and female soprano, forecasts just how integrated electronics would become with live performance. By Disc 3, electronic music's exponential rate of progress is evident. From the otherworldly, digitally harmonized vocals of Paul Lansky's "Six Fantasies on A Poem By Thomas Campion: Her Song" (which he programmed partially in the FORTRAN computer language) to Krautrock pioneer Klaus Schulze's ornery, beat-driven "Melange" to the massive, droney void in Maryanne Amacher's "Living Sound, Patent Pending", it's clear that by the late 1970s, composers were breaking down sonic barriers by the day. Growing out of the painstaking mold of punch cards and handmade circuitry, these musicians took one step closer to modern electronic production methods of sonic manipulation and construction. Ironically, they were also becoming masters of the acoustic, as in Alvin Lucier's ingenious use of the tension in a single wire ("Music On A Long Thin Wire 1" or Robert Ashley's collage of human voices on "Automatic Writing". Of course, Brian Eno's ethereal "Unfamiliar Wind (Leeks Hills)" forecasts modern electronic music most directly-- but then some would argue no one's yet improved on his ambient excursions. The accompanying DVD has enough archival performance footage (performances by Morton Subotnick, Laurie Spiegel, Alvin Lucier, Pauline Oliveros, Mother Mallard, and Holger Czukay) to make it worthwhile for fans, but the real joy is in the interviews and original video productions. Milton Babbit's discussion of the difficulties of working with archaic synthesizers in the Columbia-Princeton Electronic Music Center in the 1950s and 60s is a firm reminder of just how foreign electronic sounds were to even the academic community only 40 years ago. Likewise, Paul Lansky's private lesson with theremin inventor Leon Theremin is an example of how non-user friendly electronic musical instruments could be, even to people who should have the best sense of how to approach them. And speaking of Lansky, someone really needs to issue a DVD of all the animations accompanying his pieces, because his The Dust Bunny features a great computer-generated cartoon that's one part Pixar, one part "Ren & Stimpy". Even after 70 years of innovation (and renovation), electronic music still manages to surprise.